United States was the largest economy of the world over centuries, but the latest news was that the China over took the United States and became the leading economy of the world. Here in this post I am presenting the economy of United States according to the latest addition of The World Factbook of CIA,which is based on the statistics of 2013. In the next addition of The World Factbook, we may see China as the largest economy of the world. 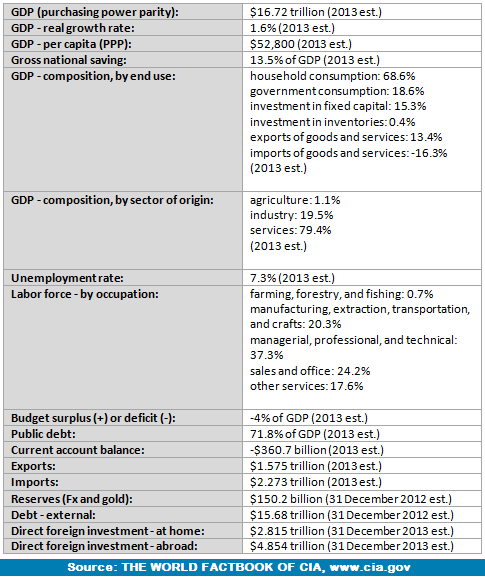 Following table illustrates the US economy with leading indicators. According to the statistics of 2013, the economy of United States represents 22% of global nominal GDP and 17% global GDP(PPP). The economy of United States is dominated by service sector, which comprises 79.4% of total GDP, and employs a major part of Americans. The American economy has a large industrial sector also, which comprises 19.5% of total GDP. American economy has abundant natural resources, high productivity and well developed structure. United States is the second largest manufacturer of the world that produces one fifth of the total global manufactured products. United States has the largest consumer market in the world because it has higher household final consumption expenditure than many other developed countries. US Dollar is the most used currency in international transactions, and it is also the world's foremost reserve currency. United States has the world's largest financial market. The New York Stock Exchange is the world's largest stock exchange by market capitalization. United States has a large energy sector, and it is also the largest energy consumer of the world. American dependence on oil import increased from 24% in 1970 to 65% in 2005. 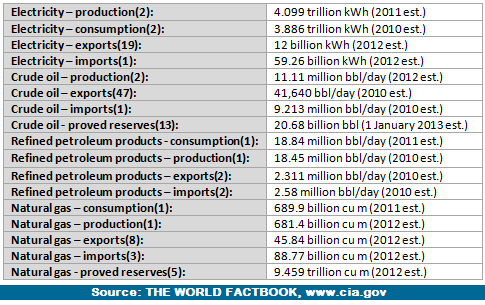 According to the Wall Street Journal, United States was about to become a net oil exporter in 2011 in about 62 years, and the WSJ predicted that until 2020 United States would continuously remain a net oil exporter. Above table shows the top five products exported by United States and top five products imported by United States. Canada is the largest export partner of United States, and China is the largest import partner of United States. The economy of exporting partners and importing partners of United States affect the value of US Dollar. Forex traders should focus on the following questions, while studding US economy for fundamental analysis of US Dollar. What are the strengths, weaknesses, opportunities and threats of US economy? Which domestic sectors largely affect the US economy? Can US affect the price of any commodity in the international market? Is US economy affected by the price of any commodity in the international market? Dear Traders, we know economies are not static rather dynamic, so the economic dimensions of a nation change every day, and forex traders need to study the latest economic situation. I will edit this post whenever a new addition of The World Factbook of CIA comes out. You can visit Wikipedia and The World Factbook of CIA to know more about the economy of United States.